A couple of weeks ago Annelise told me she wished she had a grandma. For those of you new to my story, Annelise's MeeMaw passed away in 2006, Annelise was not yet 3 years old. As she has gotten older she is more aware about families and relationships. This past summer my dad (A. calls him Pappo) married Peggy. Got it? At first, A. did not want to call her anything of the grandma variety, so she called her Miss Peggy. So back to our conversation a few weeks ago, when Annelise mentioned she really wanted a grandma. I told her I understood and that Miss Peggy could be her grandma is she wanted her to. A. didn't really say any more, but I could tell something was stewing in her little mind. About a week later she and Scott rode their bikes over to see Pappo and Miss Peggy. Later, when she came home, Annelise burst through the back door and ran right up to me with a loud, "Mama, guess what?!?! I HAVE A GRANDMA!!!" Turns out that during their visit Annelise asked Peggy to be her grandma and told her she wanted to call her grandma. Is that not the sweetest? There may have been a few tears of happiness shed. Peggy and Annelise put their heads together and decided a celebration was in order as soon as Pappo and Peggy returned from their camping trip. Annelise told me Grandma would make the chocolate cake and I was supposed to make the punch (she remembered me making the punch for their wedding I guess). 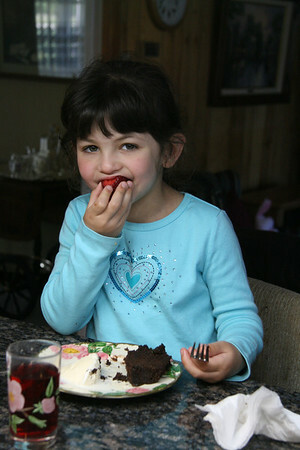 We enjoyed a yummy lunch of burgers and hot dogs followed by a tasty chocolate cake with strawberries. I did eat a turkey burger (WW friendly) and a piece of cake--with some Blue Bell vanilla ice cream (not WW friendly, but it was a party after all...). Peggy even gave Annelise a little present to remember their special day. 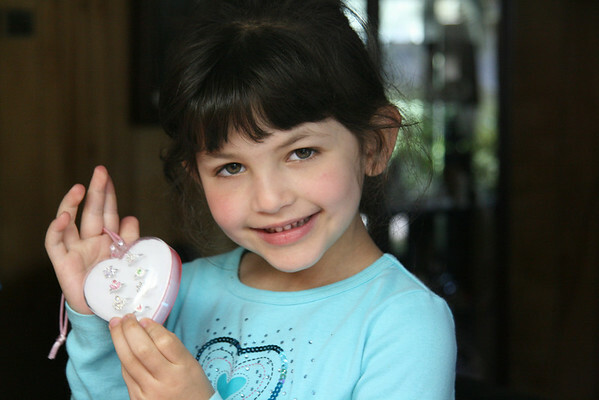 She was thrilled to get some play jewelry and her first piece of real silver, a little ballerina necklace. Here she is proudly displaying her new rings. Overall the Grandma/Granddaughter Celebration was a huge hit. 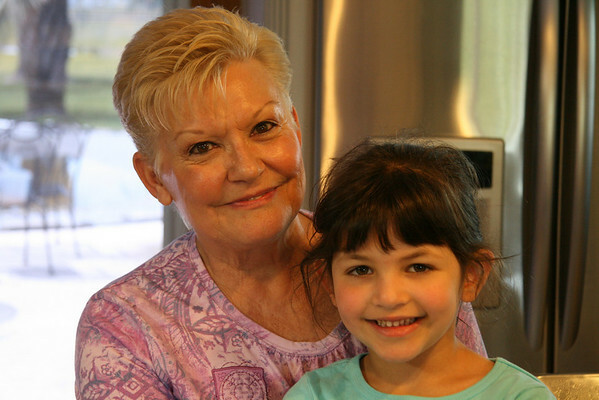 I'm so thankful to Peggy for easily accepting Annelise as her granddaughter and filling that vacancy in her life. This makes me teary! What a sweet experience for both of them. I can only imagine Peggy's heart just melting into goo when Annelise asked her to be her grandma. So sweet. What a beautiful story! I can forsee many happy years ahead with A and her grandma. Oh that made me all weepy! That is so sweet. I bet Grandma got tears in her eyes too when A. asked her to be her grandma! You're so right. Everyone needs a grandma. Even us big kids. This brings tears to my eyes. The grandma/granddaughter relationship is so special and yay for A. to take the initiative to call Miss Peggy Grandma. How sweet! A. is smiling from ear to ear in all of these pictures...she's so happy she has a grandma! It sounds like Miss Peggy will be a blessing to you and your family! What a beautiful story! What a great story and a sweet blessing for you all! Ok, that is seriously the sweetest thing EVER!!! How darling. so sweet! good for Annelise and for Peggy too! and what a fun party! A. adopts a grandma! the story chokes me up and makes my heart ache. my grandma died when I was 16. my grandpa remarried and I still call her by her name. my other granny remarried when I was about 3. we called her husband by his name all our lives, but he was our grandpa, and we made sure he knew it. I miss my granparents too! Knowing that empty spot makes Peggy's open heart and arms for A. even more special to me. I've been out of touch and am catching up tonight on my fav blogs. I LOVE THIS ONE. Of course, A always has a Neena too. But, this is a priceless post.